The U.S. Commerce Department said in a statement last week that it "has just launched its investigation into whether imports of auto and auto parts threaten to impair the national security." 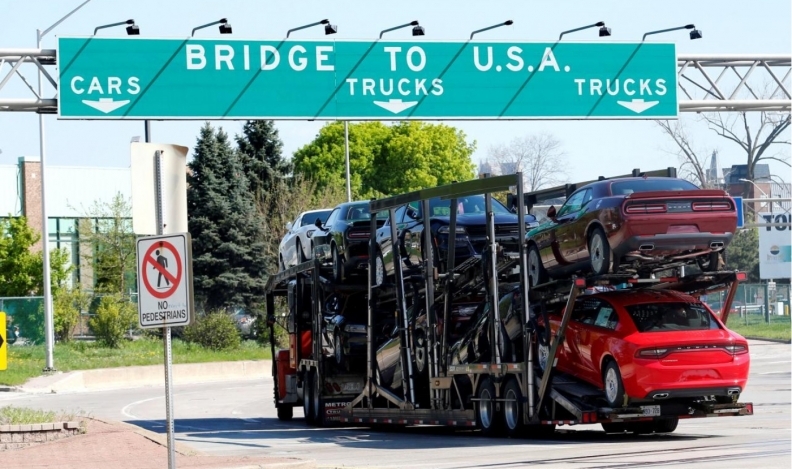 DETROIT — Every workday, about 7,400 trucks mostly loaded with automotive parts rumble across the Ambassador Bridge connecting Detroit and Canada, at times snarling traffic along the busy corridor. But if President Donald Trump delivers on threats to slap 25 per cent tariffs on imported vehicles and components, there will be far fewer big rigs heading to factories that are now humming close to capacity on both sides of the border. "It seems like it is going to be so devastating that I can't imagine that they're actually going to do it," said Kristen Dziczek, vice-president of labour and economics at the Center for Automotive Research, an industry think-tank . "We're all going to pay a lot more for vehicles," said Tim Galbraith, sales manager of Cavalier tool and manufacturing in Windsor, Ontario, near Detroit, maker of steel moulds used to produce plastic auto parts. About 44 per cent of the 17.2 million new vehicles sold last year in the U.S. were imported from other countries, and half of those came from Canada and Mexico. All have parts from outside the U.S., sometimes as much as 40 per cent. It's difficult to determine how large any price increases would be. But some back-of-the-envelope calculations show that a Chevrolet Equinox small SUV made in Canada would cost about $5,250 more in the U.S. if General Motors doesn't eat part of it. That's based on an average price of $30,000 in the U.S. for the hot-selling Equinox, made primarily in Ingersoll, Ontario. Tariffs are charged on the manufacturing cost, which is about 70 per cent of the sales price. Jeff Schuster, senior vice-president LMC Automotive, expects U.S. new-vehicle sales would fall 1 million to 2 million per year if tariffs are imposed. The pro-free trade Peterson Institute predicted that if other countries impose tariffs, U.S. auto production would fall 4 per cent, costing 624,000 U.S. jobs in about one-to-three years.